Around when the cool autumn wind was about to drive away the scorching heat that had continued almost for a month, 200 overseas members visited Korea as the 69th Overseas Visiting Group. They came from 82 churches in 17 Spanish and Portuguese speaking countries in Europe, Africa, and Central and South America the farthest continent from Korea. They entered Korea one after another from August 30. Their visit to Korea from such far countries that are different in season and time was to meet Mother and receive the power of the Holy Spirit, with which they will save the whole world. As it took two to five days for them to come to Korea as they had to travel through other countries, Mother welcomed them warmly and expressed Her yearning, gladness, and love for them in each language of theirs. In the arms of Mother who blessed them, “Receive the Holy Spirit much from Father and become great prophets,” the overseas members were consoled a lot. On September 1, the schedule of the over-seas visiting group began in earnest, starting from the opening worship service. Mother said, “Father prophesied from the early days of the gospel that His children would come from afar, and now the overseas members are coming to Korea according to the prophecy. All the prophecies of the Bible are fulfilled, so please cheer up, having hope for the eternal kingdom of heaven.” General Pastor Kim Joo-cheol preached on the mission of the prophets who spread the light, emphasizing that when we shine the light of Jerusalem’s glory as prophesied in Isaiah 60, numerous heavenly children around the world will return to God. Mother reminded them that our home is in heaven, saying, “Let us throw away worldly desires and devotedly serve others, following the examples of God, so that we can live for eternal things.” From the teachings of Mother, the overseas members gained much spiritual enlightenment. 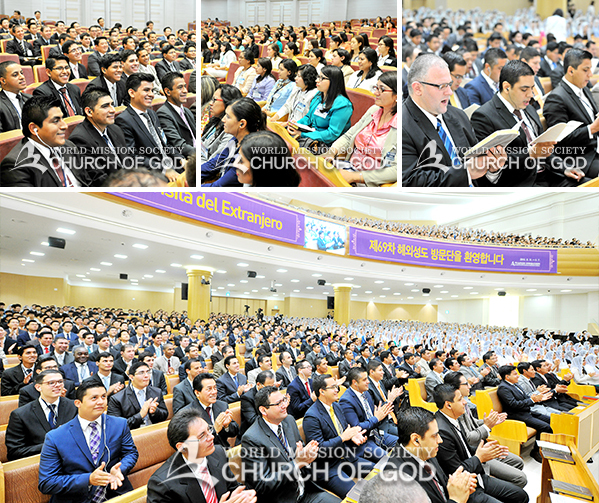 They visited the New Jerusalem Pangyo Temple and the Bundang Temple, the Church of God History Museum, training institutes, and some churches in the capital area that bear the imprints of Heavenly Father and Mother’s sacrifice. Through the visits, they realized God’s love all the more and shared brotherly and sisterly love with Korean members. When touring around N Seoul Tower, Seoul History Museum, Pangyo Techno Valley, etc., they could see how much Korea has developed and how the prophecies of the Bible have been accomplished.